Follow the in-game instructions for the following moves. Ben 10 Omniverse is the kid’s favorite! And Ben 10 Galactic Champions is one more game that is totally going to be your favorite too. Play the longest and most interesting Ben 10 Omniverse game – Galactic Champions – online for free. This game, Ben 10 Galactic Champions, is what everyone loves to play and that makes it one of the most played Ben 10 Omniverse games on our website. Ben 10 Galactic Champions is a complete game with all the 10 aliens, many tournaments, quick fights, difficulty levels and much more. It is also the longest Ben 10 arcade game. Play the Ben 10 Galactic Champions game for free. 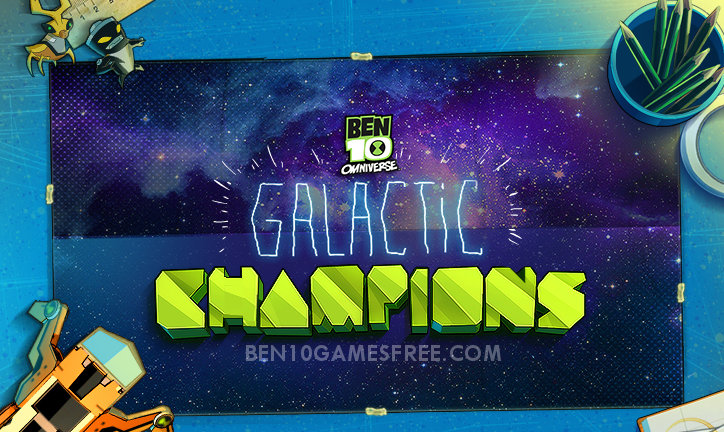 Make the best team of Ben 10 aliens and win tournaments to become the Galactic Champion. As mentioned earlier, Ben 10 Galactic Champions is a complete Ben 10 game. It is like story mode game and you get to choose almost everything right from the beginning of the game. It begins with choosing the kind of Omnitrix watch you want to play with. There is total eight Omnitrix watch you have to choose to start your game. After choosing the Ben 10 Omnitrix, you get to choose one from the three aliens and begin your journey in the Ben 10 Galactic Champions game. Pro Tip: Choose the alien you are familiar with whose moves and powers. With your desired Omnitrix and alien in place, now you are all set for challenges. These challenges come in two modes. Quick Fight – This mode is a one on one fight between aliens. You will be against one random alien and the only way to win is to beat the opponent. You choose either to attack or defense or use items from the shop. All is upto your skills, how you fight. Tournament – This is something more challenging. Battling against the team of aliens in multiple rounds and reach the final round. You can use all your powers and if you win the tournament, you get rewards as well as a new alien to play with. Apart from these modes, Ben 10 Galactic Champions game also has a Training mode where you can spend your reward points to train and upgrade your aliens. The more you train the stronger your aliens become! Another interesting stuff is Ben 10 Galactic Champions codes, but they are not available until you reach higher levels. Make the Best alien team and win all the Tournaments to become the Galatic Champion! Good Luck! Don’t Forget to give your rating for Ben 10 Galactic Champions Game and share your tips and tricks to win this game in the comments section below.